A group of students from an all-girls school went to Peru earlier this month to help with a two-phase water filtration project for the remote village of San Pedro de Casta. Many community members were suffering from a limited and poor-quality water supply due to exposed and damaged pipeline. The students worked alongside locals and Engineers Without Borders to replace the old pipeline and install sand filters. The second phase of the project will begin early next year. Check out these students digging the route for the new water pipeline! 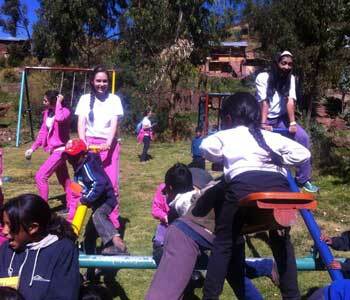 The girls also had the opportunity to spend a week in Cuzco to work at the albergue, a home for impoverished rural children that allows them to attend public school. The students were able to play games with the kids, help remodel the multi-purpose and sewing room, as well as refurbish the kitchen to make the home more inviting and comfortable for the children staying there. Congratulations to our partners, Journeys for Good, on winning three Emmys for their work showcasing our Cambodia program! Produced by the good folks at Journeys for Good, the documentary won for Best Cultural Program, Best Camera and Best Editing. In December 2012, award-winning husband and wife production team, Steve and Joanie Wynn, embarked on a volunteer adventure to Cambodia with non-profit Globe Aware. They documented the experience for their public television series, “Journeys for Good”, developed with KQED-TV and their San Francisco Bay Area production company, Bayside Entertainment. Remove the stems from jalapenos. Using tongs, hold the peppers over a stove burner and rotate until roasted, about 1 minute. Slam your head of lettuce down on the counter stem side down. Pull on the stem to remove the heart and discard. Rip the head of lettuce apart. 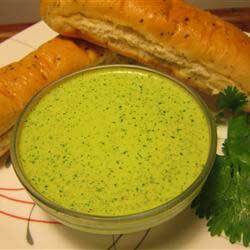 Place lettuce and one or two of the roasted jalapenos into a blender or large food processor. Blend on low speed until jalapenos are ground up. Add the mayonnaise, and pulse until blended in. Gradually blend in bread cubes until you get a nice thick but still pourable consistency. If it gets too thick add more mayonnaise. Taste, and blend in more peppers if desired. Serve with your favorite dishes, like Saltado de Pollo, or simply dip your bread in it!